Given the current white-out, courtesy of the so-called ‘Beast from the East’, it seemed appropriate to put together some winter elements connected to the School. The title is, of course, the name of the Shakespeare play. As Mamilius, son of Leontes & Hermione – no, not that one! –says, a ‘sad tale’s best for winter’. During the School’s history, before it achieved independent status, pupils attended under indigent circumstances. Mostly, but not exclusively, these were caused by the death of the father and breadwinner – a sad tale indeed. It was so often the case that the locals referred to the pupils as the orphans on the hill. Connecting this inherent sadness with Shakespeare’s A Winter’s Tale, the father of one of those pupils, and whose death caused her to attend the School, was a drama critic, author and Shakespearian scholar. 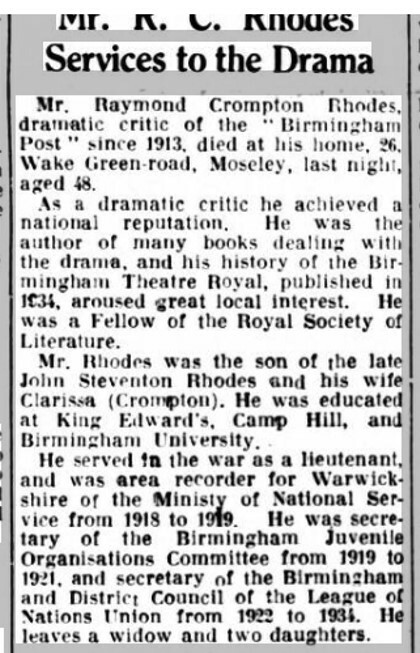 Raymond Crompton Rhodes, known as RCR, died in October 1935, following bronchitis and pneumonia. His funeral was attended by the managers of all the Birmingham theatres. As the article above says, he had been a drama critic for a long time and was well respected as such. He had authored many books on the theatre and had renown as an expert on Shakespeare and Sheridan. Presumably because of this, the Assistant Manager of the Theatre Royal, Birmingham, Philip Rodway, indicated in his will that his play texts collection was to go to Mr Rhodes. would not be deemed strange. The notion of being buried alive furnished many a ghost story of the period, all very suitable for a dark winter’s night. But back to the theatre. 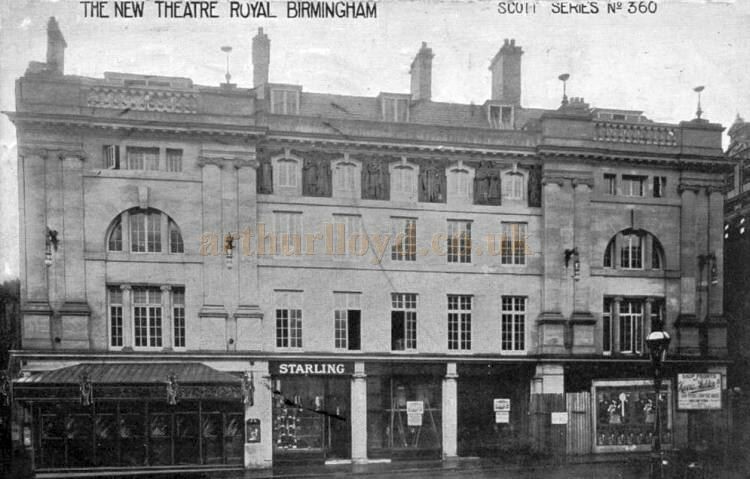 ‘The Birmingham Theatre Royal collection comprises play texts and prompt books dating from the mid to the late nineteenth century. Many are printed, about 300 are manuscripts. The majority of the manuscripts are copies made for prompting and for stage management. Quite possibly within them somewhere is A Winter’s Tale! After RCR’s sudden demise, the collection went to Birmingham library where it is still held today. In school records, the Rhodes family address was Shakespeare Drive. No doubt the spirit of RCR would have approved! As the wind howls outside, one is reminded that warm clothing is essential in winter. The School from its inception in 1788 had been funded by Freemasons. This extended not only to the provision of buildings, books and teachers etc. but also to food and clothing. And the latter was not just during any pupil’s time at school but to equip them on the journey into the world beyond schooling. What these outfits were varied throughout the years. In 1788 it was specified that, on leaving the School, each pupil was to be provided with ‘Gowns, petticoats, aprons, shoes, shifts, caps and Tuscan hats.’ Tuscan hats were straw hats, the straw originally coming from Tuscany so that the style came to be called Tuscan even when it no longer had any Italian roots. Later in the School’s history, the Tuscan hats gave way to hats (unspecified) but the provision of a coat was always included. During the war, when clothing was on ration, the provision for school leavers of a coat, dress and shoes became a real godsend. To begin with, the girls would make their own clothes but by the twentieth century the provision of certainly outer garments, and often all of the outfits, came from shops. Arding & Hobbs in Clapham was used for many years, even after the School had moved to Hertfordshire. Then it was replaced by Trewins of Watford which was much closer and made the already arduous task for harassed housemistresses of outfitting leavers perhaps very slightly less fraught! As anyone who has experienced it will affirm, taking one teenager to be outfitted for winter, top to toe, in the off season and all accomplished within one hour, was a Battle Royal. To take a dozen …. The cloisters, the Garth and the long, long corridor are noticeable parts of the School on its current site. Traversing any of them at a time of day when no-one else is can be intimidating. Today the corridor is punctuated by fire doors which close automatically in the event of a fire. They also close automatically every evening and there is something rather eerie about being in the corridor when, with a sudden loud click, all the doors start to close without anyone near them! Moving away from winter (the season) to Winter, a surname, there are 2 pupils who have had the name. They were two of the four daughters of Joseph & Caroline Winter. Ellen Lockwood Winter was born in 1853 in Chirk, Denbighshire where her father was the stationmaster. From there, he moved on to be innkeeper at Barr’s Railway Station in Hereford and Annie Gorton Winter was born there in 1856. Above left: the bridge carrying the rail line into Chirk (from Wikipedia) and right: Hereford station today (from Google Earth) but probably, apart from cars, not looking much different than it was in 1861. Joseph Winter died ‘after a lingering illness’ on 3rd May 1864. His two younger daughters subsequently became pupils. Ellen won the Vocal music prize in 1868 but had left the School by the 1871 census. In fact, there is no trace of her in 1871 but in 1875 we catch up with her. On May 5 1875, she married at South Kensington St Luke, the groom being Julius Christoph Richter, a merchant born in Königsberg, Prussia. After this very brief appearance in public records – which also includes a reference to her sister who was a witness at the wedding – Ellen disappears off the radar again. Given that her husband was a merchant, perhaps they travelled a great deal and thus the British records do not see her. In 1941, in GRO Consular Death Indices, we find her death on 9th May in Buenos Aires, Argentina. Her sister, Annie, was accepted as a pupil on 13th April 1865. In 1871, she is found with her mother and another of her sisters back in Hereford. Annie would have been due to leave in April 1871 so she had perhaps only just returned home when the enumerator came knocking at the door. Like her sister Ellen, she won prizes: one for general proficiency and one for French recitation, both in 1868. Her brother in law was from Königsberg and that is where we next find Annie. We do not know why she was there but perhaps she had travelled there with the newly married couple. The two sisters would appear to have been close so this does not seem an unreasonable supposition. On the other hand, she may have been, as so many pupils were, a governess to a family there, such a place found via her in-laws. Today, the city does not exist. 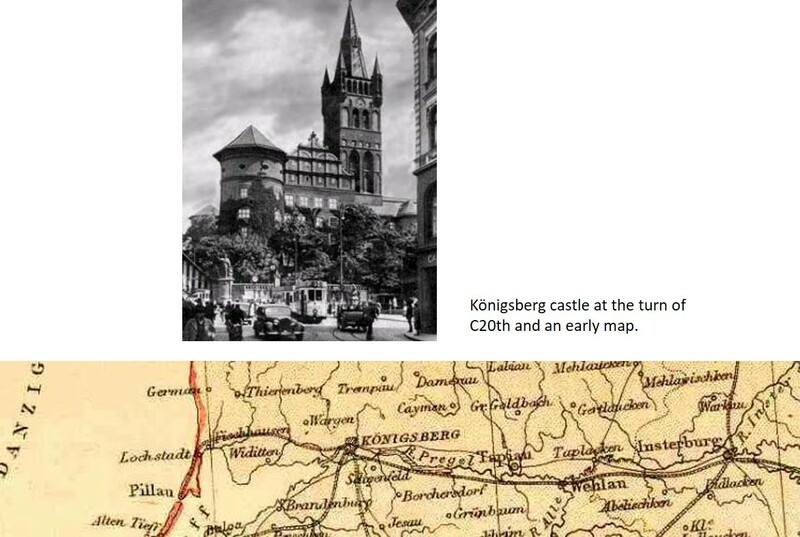 Kaliningrad which stands where Königsberg used to be is actually a new city as Königsberg was completely destroyed in WWII. For whatever reason Annie was there in 1876, we know this because it was where she died. She was just nineteen years old. But so that we don’t end entirely on a sombre note, let us finish with a reference to one of Königsberg’s famous sons, Ernst Theodor Amadeus Hoffmann, author and composer. It is his stories that form the basis of Offenbach’s Tales of Hoffman opera. He also wrote the novella The Nutcracker and the Mouse King, on which Tchaikovsky’s ballet is based. And that is a ballet traditionally put on in winter, around Christmas, with every little girl wishing she could dance the part of Clara. If we have to have a ‘beast from the east’, the Mouse King is better than snow and ice. And it makes a good winter’s tale. Or should that be tail?